Francis was an outstanding guide. I scheduled him because I wanted someone who was flexible and who could navigate the logistics. Francis was spot on with his advice and he guided us through the Argentine side of Iguasu on a busy day with virtually no waiting around. His mastery of the logistics was amazing. He also ha a great personality and my kids enjoyed him. He was the perfect guide for us. Francis made the booking easy and answered questions I had about the tour in full and clearly. He was knowledgeable and made the tour interesting. He even managed to spot a Toucan in the trees which was special. Very enjoyable afternoon. We couldn't have had a better guide than Francis. We had 2 fabulous days exploring both sides of the Falls. Francis got us past all the lines, helped my wife who has mobility issues and was a delight to be with. Truly sensational guide, who centres all of his attention around your needs. Francis makes every effort possible to deliver against your wishes and carefully manages your expecations. He goes above and beyond what we as a family had expected. As my son described it, the best guide ever! Francis is an experienced tour guide who can arrange and pace your tour properly so your plan is fully accomplished. He impressed us with good English, friendly attitude and calm organization. Because of his tour guide status he was able to whisk us through various checks and lines without waiting, At the end he was also very helpful in making arrangements for us with another guide for the following day when he was personally not available. We spent 3 days with Francis and found him to be friendly, knowledgable, flexible and relaxed. He provided us with some excellent ideas and suggestions to enhance our complete Iguassu experience. He has excellent english and a very comfortable vehicle to travel in. 5 stars plus Francis and thank you so much for a memorable and wonderful experience. We would highly recommend you to anyone travelling in this area. TOUR GUIDE RESPONSE: Thanks for your comment! It a pleasure to meet you and family, hope to see again! The tour we took with Francis was amazing! Francis organized everything so perfectly (pick up time, best seats in the Train to avoid the crowd etc) we just had to fully enjoy the beautiful waterfalls and the nature around. he Made possibile to see everything we Wanted in just one day and completely organized the tour based on our pace. i definately recomend Francis and the faboulus tour! TOUR GUIDE RESPONSE: Thanks a lot! I really appreciate your comment! Francis was very professional, friendly and efficient. Our border crossings at the Three Frontiers (Brazil, Paraguay and Argentina) were very smooth, much thanks to him. He took good photos and was adept at sporting wildlife. A most pleasant surprise was that he knew about Singapore from which we came, having taken a group of Singaporeans into Ciudad del Este in Paraguay before. We had an excellent experience. Francis came to the Guarani Airport to pick us up (and was very patient when weather delayed our flight), took us over the Parana to Brasil and Iguassu, and worked happily with us to choose the activities we wished, accomplish them, and return us to the airport for our return flight. We were very satisfied and happy we'd chosen him. Francis was a great guide to show us around Iguaçu. He was informative with his knowledge on the area. He picked up on what we were interested in, like I loved photographing animals so he made a point of finding them for me. In one day we did shopping in Paraguay, helicopter ride to view the falls, the boat ride up to the falls and we walked the Brazil side of the falls. We never felt rushed. His van was always neat and tidy and Francis was always on time throughout the 4 days. Totally recommend him. We had a grand time in in Foz do Iguçu. And Francis was a perfect guide. He is very knowledgable about the falls and the other attractions in the city. Not only does he exude his love for the place and its ecosystems, he is also a great photographer able to capture perfect angles. He conducts his tour in a calm and relaxed manner, and does not give rehearsed commentaries. We attended a dinner/show(optional), and he got us the best seat in the house. Personal and professional. Highly recommended! Francis was an excellent guide with perfect attitude, English language and local knowledge. We spent 2 full days with him. Our first day included a trip into Paraguay and his knowledge of the cross country transit was excellent to the extent of using back routes to avoid the long queues. Our second day was a trip to the Argentinian side of the falls. His vehicle was of a high standard. Francis was very friendly, helpful, adaptable and knowledgeable. I would fully recommend him to anyone. Francis is a wonderful tour guide. Prompt pickups, good knowledge at every location, when he told us he'd get us the best seats in the house for the Rafain Churrascaria show he wasn't kidding. Francis delivered beyond expectations when he showed up Mother's Day morning with roses for the ladies and after our planned tour worked hard to find us a good restaurant for a late lunch. Francis accomodated all our requests without hesitation. Book with confidence!! Francis was knowledgeable, professional, and adjusted well to contingencies. We were delighted to have him as our guide. As a bonus, he helped connect us with a guide we needed for the next leg of the trip, when we were unsure about getting one. Although a spectacular view of the Falls is available directly from the grounds of the Belmond Hotel das Cataratas, a few hours touring the Brazilian side is well worthwhile for many additional vistas and perspectives. Francis A. is friendly, relaxed, flexible, and a miracle worker in steering geriatric clients like us around long lines and facilitating special services. Correction to our prior comments about the Argentinian side: more spectacular for a few minutes' view but hardly worth 6 hr round-trip. Although a spectacular view of the falls is visible directly from the Belmond Hotel das Caratas, a few hours walking tour is well worthwhile to see many other vistas and perspectives. The guide, Francis A., Is friendly, easy-going, knowledgeable, patient, and flexible. Moreover, he knows every trick in the book—and many not in the book— for avoiding long lines and obtaining greatly facilitated services for near-octogenarian clients like us! Francis was a great tour guide! He was very accommodating to our interests and needs. We spent a day travelling and seeing both the Argentina and Brazil sides of the falls, as well as a boat tour. He was very kind and knowledgeable and had great recommendations. Would highly recommend! Francis was very personable and did a great job leading us around the Argentine side of the falls. He got us going in the right direction all the time and in the right places. I think he came up with a wise order of doing the walks. He took us to the hotel for a buffet dinner before heading back to the airport and that was good and fair value. We really enjoyed our time a Iguazu and felt it was worth the one day trip while in port (Buenos Aires). He provided us a large and comfortable vehicle. If you ever visit the Iguassu Falls, Francis is an excellent guide to hire. He not only showed us and walked the many paths around the magnificent falls on both Brazil and Argentina sides, he suggested other interesting activities for us to explore such as Parque Das Aves, Foz do Iguacu, the Bird Park, the Wanda Mines in Wanda, Argentina. He knows the areas very well and is thoughtful in planning out the daily itinerary so we could maximize our experience. He is great in creating memories for us. We had a wonderful day with Francis for full day tour from Iguazu (Argentina) to Paraguay. Enjoyed Itaipu Dam, La Ciudad del Este, and Salto Monday. Thank you for such a memorable trip. Really enjoyed our two days with Francis. He has a warm and friendly personality, and great English. We were hit by a massive tropical storm whilst visiting the falls (Brazilian side). Being drenched in the torrential rain, and entertained by thunder, lightning and falls made for a more memorable experience. Francis' tour to the falls was great. He had lots of good information and let us take our time on the journey. Thanks! On time arrival, good factual presentation on an interesting topic. All and all a great guide to a good location. Francis was extremely helpful and friendly. His knowledge of Iguazu was impressive. We managed to do both the Brazilian and Argentinian sides of Falls, plus the boat ride, in a day. Nothing was too much trouble for Francis. We were able to go at our own pace and follow our own itinerary, plus recommendations. It was a brilliant day and a great tour with a great guide. Highly recommended. We will be coming back to spend longer in Iguazu and book more tours with Francis. Francis, being a local, is very knowledgeable about the falls and surrounding area. He was instructive at every viewing point and knew where the good photo stops were. He was also very good at navigating the crowds, the que's, and countless boarder crossings. He moved at my pace and at no time did I feel rushed. I highly recommend Francis is your are visiting this area. Francis provided us with a fantastic tour, tailored to our specific requirements, and at a reasonable price. We recommend Francis, he will be able to provide you with a tour suited to any requirement. He offered several times to provide us with services above what we requested (which we declined), and he knows shopowners if that's your thing as well (again, we declined). He also smoothed the border crossing, which we did several times. Francis was really terrific - we had such a great trip. He was knowledgeable and professional, and recommended two great restaurants we couldn't have found by ourselves. We were traveling with two young children and he made sure the trip was fun for them too - my son said that Francis is his favourite part of our holiday so far. Francis was very patient, knowledgeable, polite and flexible. Despite having to change our plans many times, Francis manage to supply an excellent service and went out of his way to make sure our trip was as enjoyable as possible. Thanks Francis!!! Francis completely fulfilled all our expectations. This is our first use of Tours by Locals and Francis has set a very high bench mark for those that follow! It would have been helpful if he had provided us with a map of the National Park at the outset. Francis was very knowledgeable about the area and Iguassu Falls. A well planned itinerary to see both the Argentine and Brazil sides of the Falls. Made good suggestions about a place to eat and other sights. We would highly recommend him as a guide. Excellent. no other words required. We spend a very long and joyful day with Francis, in this tour to the Iguazu Falls we stretched the time more than ever. At all time Francis was offering alternate routes to get the best views possible, and with enough time to appreciate this magnificent place from both sides (Argentina and Brazil). Francis receive a big thank you, Gracias, Obrigado. We appreciated your company during our visit to Foz de Iguazu. I would definitely recommend Francis as a guide. Francis met my wife and I at the airport in Argentina and took us to see the Brazilian side of the falls. He was a great help negotiating the border formalities and took us on a spectacular tour before dropping us at our hotel. The next day he guided us around the walks on the Argentinian side of the falls. It was truly worth seeing both sides for the different perspective. Travelling with Francis made the whole trip very simple from airport, back to airport and all points in between. Went above and beyond to ensure we enjoyed our tour. Francis was a very nice guy who made our day trip to Paraguay very easy. He accompanied us during the multiple border crossings, drove very safely, sorted out paper work and even customised our tour to include a Tati Yupi, a nearby national park. Francis was always courteous and friendly. A very nice day out! Francis was absolutely phantastic and took care of all our needs. He also helped us with restaurant reservations and advise when needed. He did this in extremely polite manner and was at all times non intrusive. I would take him anytime again and can only recommend him highly to other guests. Great guide and tour. Francis is the best guide. Very accommodating and polite. He has a great knowledge. Great local guide when you're in Foz do Iguazu. Francis is a friendly, well-informed English guide. He is also flexible about the schedule, when needed. I highly recommend him. Our Guide Mr Francis is a fantastic guide, not only he is friendly, knowledgeable but very helpful indeed. He made use of the spare time to help you to other entertainment. Of all the tours that i have been he is the best guide I have known. 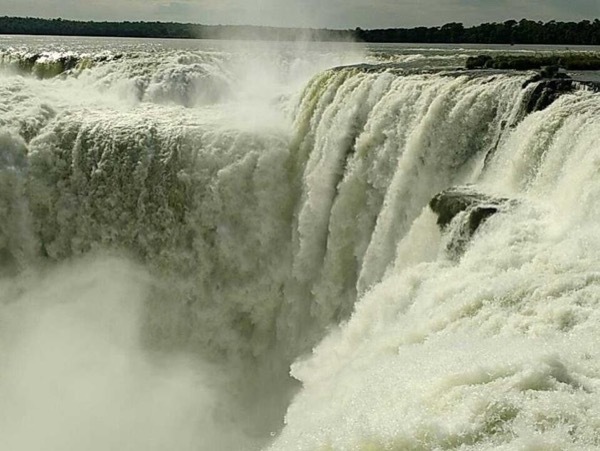 I will definitely recommend him to every of my friend who would like to visit Iguazu Falls. Teong Seng Lim and Anne from Malaysia. Francis was a great guide. Very knowledgeable about both sides of the Iguassu Falls and also Paraguay. Francis also has a pleasant and happy personality.I would definitely recommend Francis as a guide. Francis is an excellent guide, he made the difference to our visit to Iguassu, he adapted the tour as per our requirements and we were able to visit all the falls as offered. TOUR GUIDE RESPONSE: Muchas gracias por todo. Suerte para la proxima Olimpiadas! Frances was a great guide. Despite being a bit ill the day of my tour, he fulfilled all my requests for my tour, including an excursion to Paraguay. He drove and helped at all border crossings and found good out of the way places to eat. Highly recommended. Tour guide was reliable and competent, getting us to both sides of the falls on time and safely. What was missing though was enthusiasm, interest in providing a background and historical perspective. I understand he was not feeling well, but both my travelling companion and I felt that our guide was going through the motions and less than thrilled. TOUR GUIDE RESPONSE: Thanks for the comment. All the comments are important to improve the best for all clients. I strive to provide the best in all situations and itineraries. Francis did a great job for me. I had very limited time in Iguassu Falls, and he made sure that I got to see everything that I requested. He was fun to talk with, and very informative. I would definitely recommend him next time you need a guide in the area. Although we enjoyed our afternoon tour to Paraguay, it was despite - rather than because of - our guide. There was no structure to the tour, and he seemed unsure as to what he should show us. Fortunately we had our own ideas, but left to his guidance, I fear that it would have been a rather aimless afternoon. Francis is exceptionally quiet, and doesn't seem to realise that being a tour guide requires more than being a good safe driver - you have to take the initiative and interact with your clients. TOUR GUIDE RESPONSE: I apologize u were unhappy & I respect ur feedback.I will improve negative points u mentioned & work to provide the best tours always.I would like to defend my side.I had only 1 full day+late afternoon to show my area,I didmy best to fit all the tours you choose + border crossing(8X).We had flights changed & I was flexible & rescheduled the tour.I do recommend longer stay for interaction w/locals.I will drive safe/take to safe areas,always looking out for ur safety/welfare. We booked 2 tours with this guide, and experienced similar problems with both. Francis is very quiet, and simply does not interact with clients in the way that one would expect of a tour guide. He provided virtually no context to what we were seeing, and attempts to prompt interaction received a curt response that shut down further discussion. Much of the time he seemed more preoccupied with his own photography than in guiding us. To be positive, he is reliable and a safe driver - but not a guide. My daughter and I loved our Iguassu Falls experience. We had limited time to see the falls, and Francis was perfect in every way. He is an excellent guide, very knowledgeable, and very willing to accomodate our schedule and needs. Five stars does not adequately all the kindness and thoughtfulness we received. Francis is a very personable guide and has extensive knowledge of the area. He made our trip hugely successful. I achieved all my goals and reached all 3 countries. Traveling with him was effortless as he took care of all the issues with passports. He brought us to all the right spots. His english was flawless. And the best part is he is also a geocacher. If you follow that game then he is the best choice for a guide. I also introduced him to Munzee. Francis was really a perfect guide for us. He was right on time, left us (a family of four) to see the sights at Iguazu National Park at our leisure, and always seemed to show up right when we were ready for the next part of the adventure. Despite the inclement weather, he never seemed rushed. He was always ready to offer information about the area and answer our questions but also didn't feel the need to make constant conversation, which was a pleasant change from some tour guides. We really enjoyed the tour. Francis was friendly,knowledgable about local wildlife and a good guide. We were able to pack alot into one day. The Argentine and Brazilian sides of the falls gave a completely different perspective and vantage points so very happy to have the chance to view both sides. Francis is a wonderful guide and I recommend him highly for anyone visiting Iguassu Falls. There is so much to see and it is critical to have someone help you cover it all, make sense of it and explain some of the finer details. He is knowledgeable, patient and flexible. We arrived later than we wanted to b/c of a flight delay, but he was able to adjust and make up for most of the lost time. It also doesn't hurt that he's an amazing photographer. It comes in handy in a place like this. Francis was an excellent guide. Very friendly and knowledgable about the falls and surrounding area. I thoughorly enjoyed my tour. Francis picked us up at the airport and immediately took us to the Argentinian side of the Falls. After a great tour -- he provided information on history, flora and fauna, he took us to the hotel where he picked us up the following morning and took us to the Brazil side. He stayed in the background but always was there for questions or to take a photo. He then took us to the airport. He also emailed some photos of us that I could send on to family. We were pleased with Francis & amazed by the Falls! Francis was very knowledgable. He answered all our questions. The best thing about the tour was that he didn't hurry us. We stopped and took all the pictures we wanted. Highly recommend this tour AND Francis! Just a few lines to say how satisfied we were with our trip to the Itapúa Dam and the Iguassu falls. Francis was our guide. He was excellent. Very courteous and most informative about the area. I would recommend him to any potential travel in the area and likewise recommend Tours by Locals-They are the real professionals. Thank you Francis and tours by locals again for making our trip a memorable and most enjoyable one. Considering our flight was delayed over 3 hours Francis tried to fit in as much as possible with what was left of our very short day without overdoing it and gave us good advice about planning our next day. Our guide Francis is the best. He was knowledgeable, timely, considerate, and everything you would ever want in a guide. We had a very short time to see the Falls and he arranged our visit to make the most of every minute. You cannot go wrong with Francis. He is an asset to ToursbyLocals.com. Great tour guide - responsible and timely in his email responses, Very knowledgeable about history of the falls and Foz do Iguacu in general. A complete tour of Iguazu Falls includes trails in two countries: Brazil and Argentina. To get to these trails without hassles, lineups and time wastage in trying to find unknown yet required details (in a country where very, very few speak English) having a knowledgeable guide is a must. Francis knows "everything Iguazu" inside out and also speaks perfect English. He will also suggest other activities in Iguazu Falls (e.g. Rafain Churrascaria Show). Excellent guide. Highly recommended. Francis was outstanding. Spoke perfect English. Especially helpful when one member of our party could not walk, he got a wheel chair and pushed her around the entire upper trail. Our hotel lost our confirmation, and he stayed with us helping with language until the problem was solved. Prompt, patient, knowledgeable, one of the best guides we have ever had. Good dinner recommendation, vehicle very comfortable. Best of the best. Our guide Francis was great. English skills very good. Very efficient getting us to see everything. He pushed us to do a boat ride and it was fantastic. Great Tour and knowledgeable tour guide of Iguazu Falls! Prompt on the pick up and drop off at the airport, as we made it a day trip from Buenos Aires. Very calm and relaxed and a good guy all around! THE FALLS WERE GORGEOUS! Highly recommended tour! We enjoyed our tour of the falls with Francis. He provided much needed commentary to help us fully appreciate the beauty of the falls. He also took for us many wonderful family photos. Francis did a fine job for us at Iguazu. He met us at the airport, saw us to our hotel, and offered to help whenever he saw a need. He knew how to help us avoid standing in the long line at the Falls. He is not dynamic, but he is pleasant and knowledgeable. He brought his 5-year-old daughter the last day when we went to the bird park, and seeing her with our 5-year-old granddaughter was a delight. Frances was a great guide. We enjoyed the day very much and he was exceptionally well informed about Iguacu Falls and the nearby town. Very careful driver who made us feel very much at ease. He has our highest recommendation. A very convenient, customised tour to see the best of Iguacu in a day and a half, without hassle and stress ! Francis is a terrific guy and companion. We missed our flight and arrived 3 hours later than expected. We notified him and he availed himself for us according to our time table. Francis is an easy going and and considerate as well as very knowledgable. Enjoyed him very much. Francis could not have been more helpful and pleasant. Very knowledgeable about the park & history of the area. Made the visit a delight, in spite of the seasonally warm weather. Francis especially was helpful since we visited in a holiday when the visitor crowd swelled to over 11,000 people (normal day is @ 4,000). Without resignation I would use the services of Francis again! Very enjoyable trip made better by the presence of a knowledgeable guide. Francis went overboard to make our trip the best that it could be. Francis was punctual, courteous and very helpful. His knowledge of his and his neighbouring countries coupled with his courteous and helpful nature added value to our tour. Our group of 4 people highly recommend Francis's services. Thank you Francis for the wonderful time seeing the falls. Although it rained in Argentina we had a great time warming up at the Sheraton Coffee shop overlooking the falls. We were also grateful for the Saturday Mass with the Bishop at the church you were married at.